I’ve been performing close up magic in NYC for years now and have made a reputation as a mentalist in NYC as well. Occasionally I like to board a cruise ship and get my traveling in by performing magic and mentalism in the ship’s lounges or theaters. Recently, I boarded Oceania’s Marina and last night while performing there was an especially lively crowd, with lots of energy generated! There were several gasps when the signed card came out of the sealed envelope in my wallet, and a real scream from a woman from New York City when her card rose out of her hand. 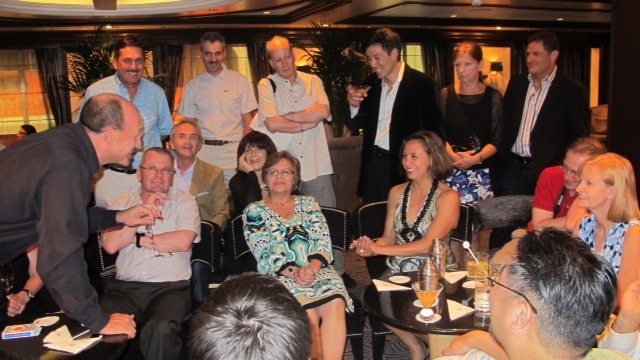 I’m looking forward to my mentalism stage show in the main theater near the end of the cruise. I’ve added a new special effect and I’m excited to see how it’s received! Stay tuned for the update!